Synopsis: It’s all-out war (and no-holds-barred romance) in the climactic conclusion to Carrie Jones’s bestselling series. 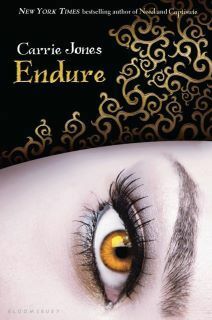 Review: 4 Stars - Endure by Carrie Jones is the fourth and final book in her Need series. Jones ties up all of the loose ends and questions found throughout the series nicely in this eagerly awaited title. Zara has a lot to come to terms and deal with… which is what she faces throughout each of the books, but things have finally all bubbled to the surface forcing her to make some choices and to face the consequences of choices from the past. She does this all while trying to save the world from the evil pixies who would love nothing more than to make her life and everyone around her a living hell on earth. Throughout Endure I found it easy to be swept away with Astley. I was on the fence about him from the first time we met him, but the more he’s been around the more I’ve been rooting for him. Then we have Nick…. his actions and his overall horrible attitude in this one made me cringe and wonder who the heck this “new” character was and where the loveable Nick of old was! I was seriously shocked by him and felt a little heartbroken at his changes. While this one might be a bit on the slow side for some readers, I had no problem at all with its pace. I was curious enough – as I love this series – as to what was about to happen next and who Zara might choose in the love triangle between her and the two boys and how they’d come up with a plan to save the world. There are some definite twists and turns in this one, that will keep you on your toes… including a trip to Iceland, which turned out to be a pretty epic trip to say the least! I had become endeared to this series since the first book Need and am sad to see it end. Overall, I thought the series was thrilling and extremely enjoyable. Following the characters from one book to the next, watching them grow and change – for good OR bad – was half of what made this a great series. Jones is a fantastic story teller keeping the suspense flowing and the action thrilling from beginning to end. I’ve had a pleasure reading this series and am eager to see just what Jones treats us readers to next. If you’re looking for a great series with Pixie’s and other supernatural/mythological creatures, the Need series would make a great addition to your shelves. Enjoy! I LOVE Astley!!! I'm so excited for this!!!!! YAY! I'm glad to see people are excited for this one too! Go Team Astley!